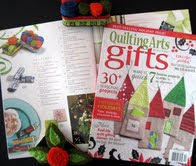 Felted Pin Cushions (upper left corner) in Quilting Arts Gifts 2010/11 Issue - out now! It's the first project in the magazine! and you recycle an Altoid tin to make 'em! Sewing my Zippy Florals art quilt on the set of Quilting Arts TV using American & Efrid zippers and Design-a-Core embroidery thread, which is also available through A&E. Here's the project. Zippers to separate squares, and I used Hoffman Batiks, and then I free-motion zig zagged zippers in the rounds of the flowers on the Bernina 830! Amazing machine! you look ridiculously content in front of that Bernina!